The Royalist cause started 1644 by recruiting a marching army to challenge Parliament's control of the South Coast region. 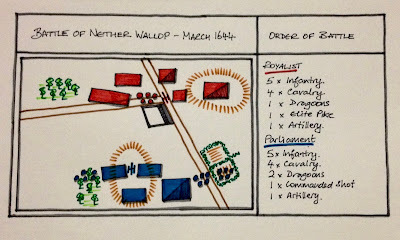 Parliament responded quickly and both forces clashed in March 1644 near the town of Nether Wallop. Terrain cards determined the tabletop and both sides deployed. Royalist forces being the smaller force were able to select their preferred side for deployment and the battle began at noon with both sides edging forward to within musket range. Parliamentarian cavalry charge forward. In the background Royalist reserve cavalry can be seen moving around to the other flank. 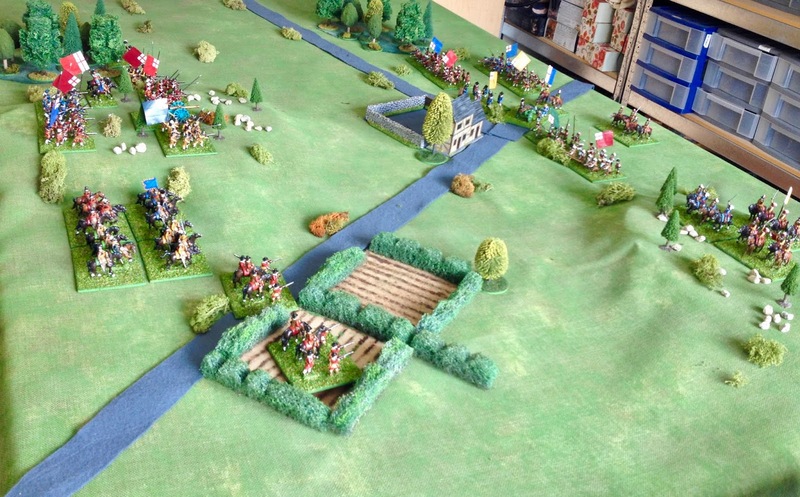 Royalist reserve cavalry appear on their right flank and Parliamentarian commanded shot hastily retire to the woods. At this stage Royalist forces were at the brink of defeat. Another loss would have seen their army resolve fail. 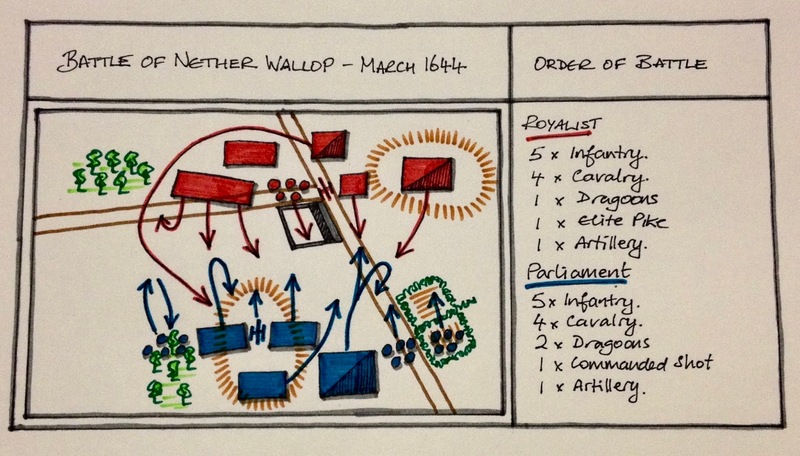 As evening closes in Royalist cavalry charges home and the Parliament army resolve fails. Another victory for the Royalist cause. They snatched from what appeared to be the jaws of defeat. 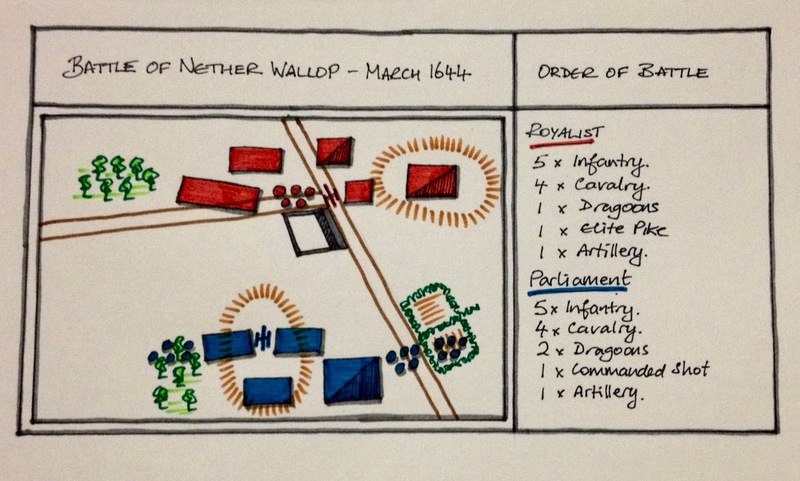 Until the final turn Parliament would have won if they had been able to rout a Royalist unit, but it was not to be. A good start to 1644 for the Royalists. A tight game again and a reminder of the importance of reserves. 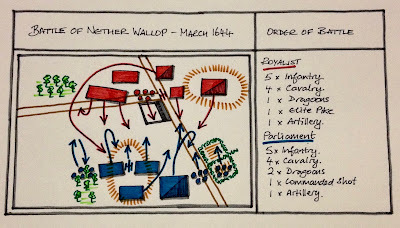 Yes, a reserve of cavalry can be very useful towards the end of a game when units have taken a few hits and a very vulnerable to charging cavalry. The Royalist cavalry are the heroes instead of the goats for once! They did do rather well in this game, holding up Parliament's cavalry and charging through at the end to win the battle. Looks very nice, game and maps! Thanks Phil. The maps help tell the game's story as it is not always easy to do so with just photos. I have found the maps on your blog to be most helpful. The poor Royalists seem to have a hard time recruiting but they are doing alright despite it. While recruiting poorly, they were fortunate there was sickness in the Parliament camp which meant there was one less cavalry unit for them to face in this tight game.